It's that *fascinating time of the year - performance review time! Many major corporations like Deloitte, Accenture, and NBA are chopping down out-dated PMS system. They are changing the way they conducted the review before. These companies wanted to make sure they were getting best results from their employee reviews. Of course, this is something all organization needs to look at before it's too late. Do you gain quality output from current review system? Check weather all you management levels plays an active role in the review process, and use the information to support any discussions? And, Does your current performance review system actually help the company set future performance and development goals that are aligned with your company's core objectives? If you have "no" answer to any of these questions above, it's probably time for an upgrade for your review system. If you're still using a paper-based manual review system, it is also likely to be extremely painful and time-consuming for all concerned. It means someone from the organization (probably YOU) needs to invest a whole heap of time pulling out the paperwork one-by-one, making appointments for every single employee, and sending out email trails to respective managers to get the ball rolling. But PMS review doesn't have to be like this. In fact, it doesn't have to be unpleasant at all. Here are 5 ways HRMantra's performance review process can help make measurable improvements to your organizational outcomes. Using HRMantra's PMS review managers can keep a live running log of notes on an every single employee throughout the year anytime. This assist paint a complete picture of the every individual's performance for the company over time â€“ not only just the immediate past of employee, as tends to be the case with paper-based manual reviews. There's nothing quite so discouraging for an employee than to have a blunder they made recently become the entire focus of their performance review, despite an otherwise representative year. Plus, it makes administrator preparation very much easier than before - because the information is all there in the system come review time. In too many mid-size organization, employees are unaware of the company's corporate objectives, and how their own goals related to them to acquire their objective. By automating the operations around measuring, creating, and monitoring performance against organization goals, your managers and administrators can ensure individual employee goals are pinned to company-wide predecided objectives. And even, they can easily stay in touch with every single employee's progress during each and every phase of goal completion. This allows administrators and managers to provide prompt & timely reinforcement or praise which of course is key to employee engagement within the organization, or offering to mentoring or coach to get performance back on track when it matters most for the organization. Automating performance reviews in your organization will surely and undoubtedly save significant amounts of time and energy across the business. While you'll be freed up from all the hectic and tedious paperwork, an HR system also lowers frustration managers and employees often feel while reviewing. Automation provides notification facilities to managers so this eliminates the hassle of chasing down managers and supervisors to complete feedback forms. With an HR system, everyone in the organization can easily log into the system when it's convenient for them. Workflows within system ensure that performance review phases are completed in the right order as decided. Including employees, self-evaluation is a vital part of the performance review process in an organization. Rather than commonly receiving feedback, actively participating in the process encourages employees to become more engaged with the review process. But, because of its added complexity, this is one step that's often overlooked in paper-based manual systems. Automating your process eventually eliminates this complexity and delivers real benefits to the organization. For example, having employees self-evaluate, allows the administrator to view performance through their eyes and get the employee's point of view. It can also help administrators to better understand a team memberâ€™s strengths and weaknesses from their own panorama, all of which leads to much better outcomes for the organization. Now Reports are more powerful. When using paper-based manual performance reviews, there's simply no way to tell how the process is progressing across the industry. You can't keep track how many reviews have been started or completed yet, so you have to rely on phone calls and emails to chase them up. Not so with an online HRMS system! You and team subordinates can view real-time reports on individual employee review status and follow up with members electronically. This means thereâ€™s no obligation to hunt down incomplete employee reviews - it's all done for you in minutes. 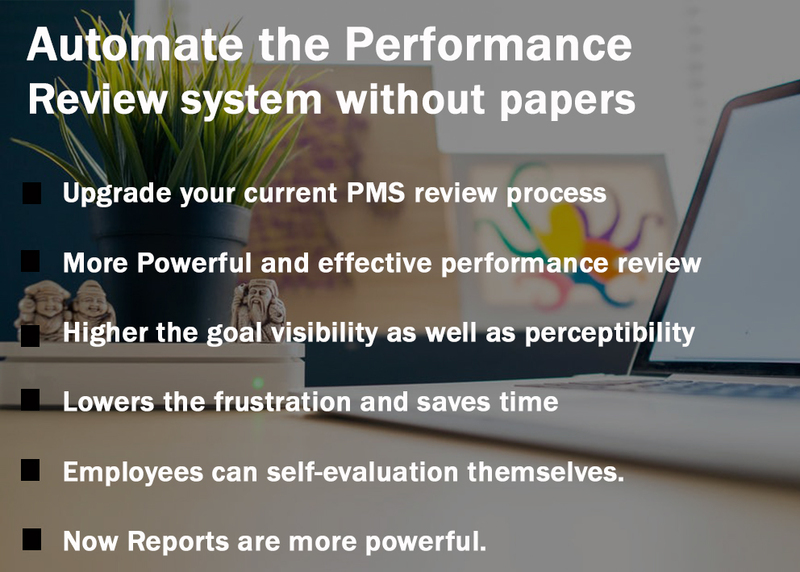 But more than this, once performance reviews have been completed, rather than filing paper-driven data away in a drawer, a cloud HRMS system allows you to access the information at any time and place. So, youâ€™ll be able to monitor the organizationâ€™s overall progress against goals and target as well as track developments in employee ratings over time. Avails more time to be strategic. Of course, developing the quality of your performance review system in the organization is just one component in building better employee engagement within the organization. With HRMantra's HRMS software, you can drastically reduce the time, energy and paperwork associated with the performance review process in the organization. By doing so, you'll enhance and intensify employee participation and improve the quality of feedback from the review process, while you free up more of your time to focus on more strategic matters for the company's growth.